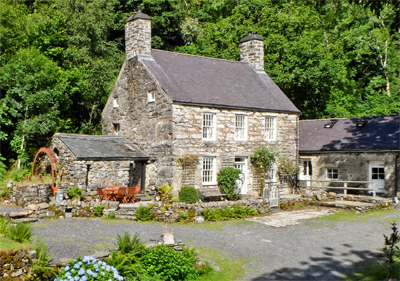 Gilfach is a wonderful small country estate in Wales with around 40 acres, set in the Snowdonia National Park. The farmhouse is Grade II listed, and has accommodation over three floors. The kitchen has a stove set inside a stone fireplace with an external door to the original mill house with its water wheel and old workings still in place. Upstairs are two bedrooms, one with dressing room, and a large shower room sits off the landing. The staircase continues upstairs to another two bedrooms on the second floor. The cottage has a sitting room with feature fireplace, kitchen/breakfast room and two bedrooms. Outside is an elevated decked balcony area which is ideal for outdoor entertaining and with incredible mountain views. Three stone outbuildings require renovation while the formal gardens. Mountain streams run either side of the land with the majority of woodland to the rear of the house. The River Dwyfor is located at the front of the house and has single bank fishing rights. The land in total comes to around 40 acres. The village of Garndolbenmaen is around four miles and has a post office and a public house. A wider range of facilities are to be found in Tremadog, on the outskirts of Porthmadog around seven miles away. The guide price is £625,000. For further information please contact Strutt & Parker on 01244 354 880 or visit www.struttandparker.com.